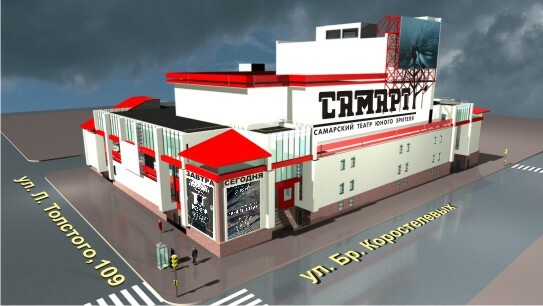 The Young Audience Theater “SAMART” was founded on 14 December, 1930. In 1999 small auditorium was opened in SAMART. It was equipped with altering chairs and a scenic site. Since 2000 the theater foyer after modernization has been used as the third scenic site. Thus, new performances were born on the stage of the theater-atelier. SAMART as an active participant of numerous festivals and other theatrical activities. In March, 2003 SAMART went to the festival in St.Petersburg with “Mother Courage” (B.Brecht) performance and received a National Premium “Golden Mask”. The other performance “Bumbarash”(A.Gaydar) had already received this prestigious reward in 1997. In 2000 SAMART celebrated its 70-th anniversary. During these years the theater has become known all over Russia due to the All-Russian Festival “Golden Turnip” which is carried out by SAMART every two years. The Festival is also a laboratory course for the young directors, as well as a master-class on plastic arts and acting techniques under the direction of the country famous and foreign theatrical workers. SAMART is an active participant in the international festival movement.